The November issue of the Bulletin has been published and is available. 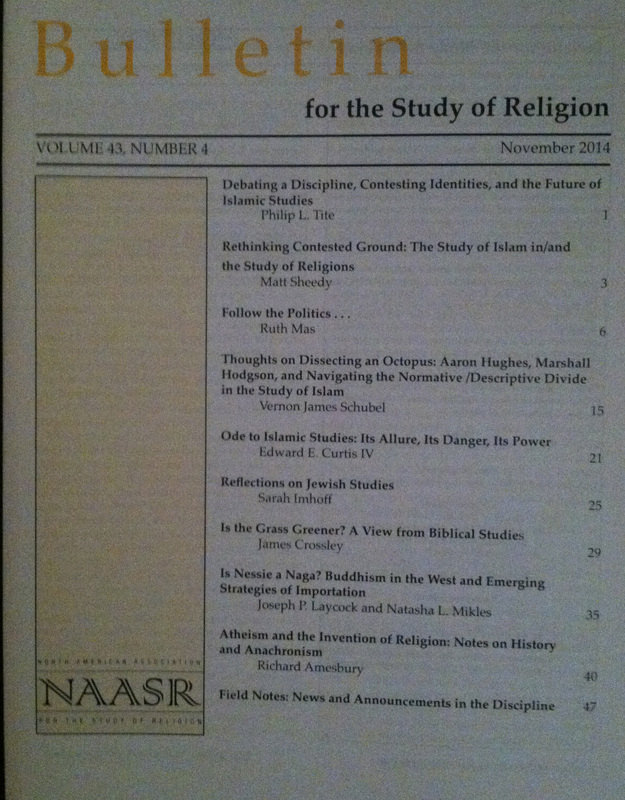 Below is the table of contents of this issue, which includes a panel of papers on the current state and future of Islamic studies with contributors building on the online debate between and in response to Aaron Hughes and Omid Safi last Spring, in part right here on the Bulletin’s blog. This entry was posted in Announcements, Joseph Laycock, Matt Sheedy, Natasha Mikles, Philip L. Tite, Politics and Religion, Reflections on Islamic Studies, Religion and Popular Culture, Religion and Society, Religion and Theory, Theory & Religion Series, Theory and Method and tagged Aaron Hughes, Belief, biblical studies, Buddhism, Bulletin for the Study of Religion, Edward E. Curtis IV, emic, etic, Islam, Islamic studies, James Crossley, Jewish studies, Loch Ness, Loch Ness Monster, naga, NEH, new atheism, Omid Safi, Religion, religious studies, Richard Amesbury, Ruth Mas, Sarah Imhoff, scholarship, Scotland, Vernon James Schubel. Bookmark the permalink.